A garden planter that mirror's a human face, is both enchanting, amusing & entertaining. This is a version called "St Francis". This cast stone concrete planter is our Roman Catholic friar St Francis of Assisi, who founded the Franciscan order. 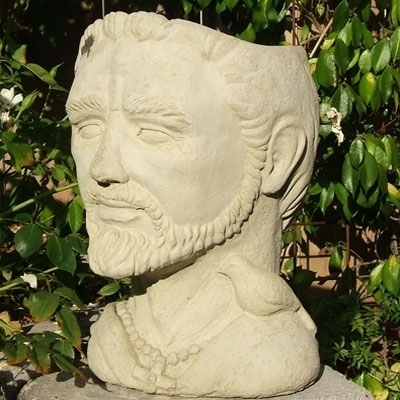 With a rosary around his neck, a bird of peace on his shoulder and his well know facial hair our St Francis is the perfect garden planter for any garden, landscape or patio decor. The details on each head planter are amazing. Fill the concrete planter with bright colorful flowers or a green plant. We love plants that look like hair. Try maiden fern or trailing ivy for fun and creative effects. Put real beads around the base of the stone head or sunglasses on the face during summer for a hilarious look. Display proudly on a patio or garden table or indoor sunroom. These make wonderful gifts. We think this cast stone garden planter will become a family heirloom, one that will be talked about for generations. Each piece of cast stone concrete is constructed of the highest quality materials; using only top-grade Portland cement. a specialized aggregate and a plethora of strengthening additives. Every concrete planter produced delivers an ultra-durable product which can endure in the harshest climates from freezing to arid. The coloring is added to the concrete mix so each product is blemish resistant. Once our cast stone garden art is hand finished and cured, a top coat of invisible water repellent and protective sealant is applied. This provides the concrete planter with even greater durability and many years of enjoyment. St Francis $129.00 10.00" 14.00" 10.00"